It was made capital of the British colonial province of Canada in 1857. Canada has three levels of government: federal, provincial and territorial, and municipal (local or regional). Canada has two official languages—English and French. 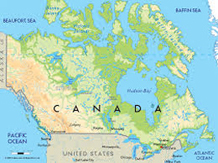 Canada consists of 10 provinces and 3 territories in 5 main regions: the Atlantic region, Central Canada, the Prairies, the West Coast and the North. Canada is a world leader in the fields of telecommunications, biotechnology, aerospace technologies and pharmaceuticals. More and more jobs involve work in service industries or in information technology. Canada spends more on education (as a percentage of GDP) compared to the OECD average, and is the second highest among G-8 countries. Canada uses a federal form of democratic government that brings together a number of different political communities under a common government for mutual purposes, and separate regional governments for the particular needs of each region. Territorial and Municipal (local or regional). A highly diverse culture, thanks to the contribution of Canadians of all origins. The culture and population are different in each region. The Atlantic region consists of the provinces of Nova Scotia, New Brunswick, Prince Edward Island, and Newfoundland and Labrador.